The solid all round performance and investment value that clay brick brings to residential housing remains unparalleled. Local and international comparative research continues to compound demonstrating why clay brick, as a ‘green’ building material, is so perfect for thermally efficient sustainable construction in South African environments. While it was the exhaustive comparative research in Australia of buildings comprising different wall construction types measured under real world conditions that proved the importance of high thermal mass clay brick walling envelopes for achieving superior thermal comfort in climates akin to South Africa, research by the CTL Group in the US, found similar outcomes. Comparing different “cladding” on a standard US house (cladding in the US being the exterior skin of the exterior walls) located in 10 different cities across the US, they found that houses with an exterior brick skin cladding used less heating energy than lightweight alternates associated with Innovative Building Technologies in cities in the South Western climates and less cooling energy in all locations. Compounding clay bricks ‘green value’ proposition, research data generated by the National Brick Research Centre, Clemson University, found in a cradle-to-grave life cycle assessment of energy consumed and pollution generated in the manufacturing a unit area (ft²) of different walling materials over the “warranted life” that clay brick outperformed Fibre Cement and EIFS. *EIFS – Exterior Insulation Finishing System (Synthetic Stucco). Composite EIFS are associated with Innovative Building Technologies such wall cladding comprising a layer of foam plastic insulation, a reinforced layer applied to the face of the insulation and a final top coat or finish. ¹ No proven method available. ³ Low weight per truckload influenced results. ⁴ Depletion of salt in processing PVC influenced results. These findings have synergy with those of the full Life Cycle Assessment by Energetics in Australia that assessed different Australian wall construction types applied to 2 house designs situated in 3 climatic zones and placed in 4 orientations. This LCA found that no matter the wall construction type, the embodied energy was less than 10% of the total energy consumed (embodied plus operational) over a 50 year life cycle. In terms of total energy consumed and Greenhouse Gas Emissions, the LCA further found clay brick cavity construction afforded a lower total energy consumed (embodied plus operational that included heating and cooling energy) than insulated lightweight weatherboard in most situations and when resistance/insulation was applied in the cavity of the double clay brick walls, those buildings well outperformed insulated lightweight weatherboard in all situations, with clay bricks superior life cycle providing for these benefits to compound into the future. Fabricated Lightweight walling associated with “Alternative Building Technologies” such as Light Steel Frame Building and Kwikspace Modular Building (Kwikspace advertise – Engineering News, March 2014 – clay bricks “as only useful as door stops”), do not have the requisite thermal mass in the walling envelope to “self-manage” heat flows and attenuate internal temperatures supporting thermal comfort conditions for longer through the seasons as does clay brick construction. It is this inability of fabricated insulated lightweight walls to delay heat transfer through the walling envelope and absorb radiant heat entering through the windows, as clay brick does so effectively, that results in the heat flux on the inside of lightweight walled buildings coinciding with the hottest part of the day outside and with that all the unpleasantness of “hot box” living environments and /or high cooling energy consumption to achieve and maintain thermal comfort conditions. Unlike the limited life cycle of lightweight walling technologies and the associated high maintenance costs, clay brick is unique in its sustainability offering, quality, low maintenance and longevity, the latter providing time for the materials embodied energy to dissipate over its lifecycle. Well proven for providing superior protection and shelter, clay bricks mineral properties add to the materials greenness providing internal environments free of volatile organic compounds – the latter resulting in better health, comfort and wellbeing. Add to that clay bricks inherent mass that provides excellent acoustic comfort and the thermal quality to take best advantage of the passive solar design opportunity, and that, unlike lightweight exterior walling, clay bricks from demolished buildings can be reused in a variety of applications including rebuilding, and clay brick presents itself as a uniquely competent ‘green’ material for achieving superior building performance with low environmental impacts. 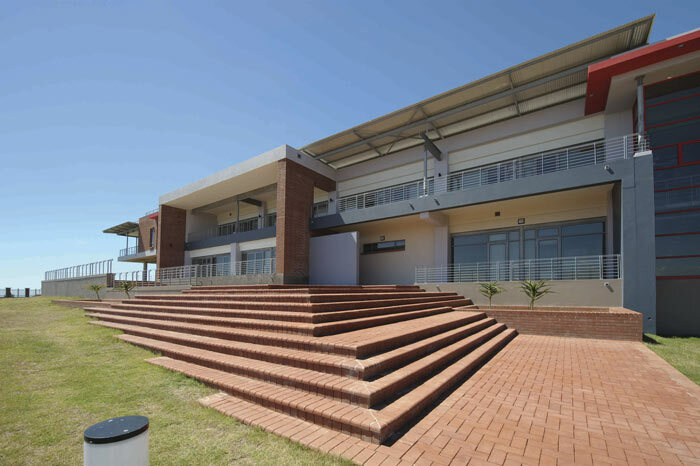 Put together, clay bricks properties, enduring natural colourfast aesthetics, lower maintenance and life cycle costs, provide for Government schools and infrastructure buildings most appropriate for serving South Africa’s longer term needs.